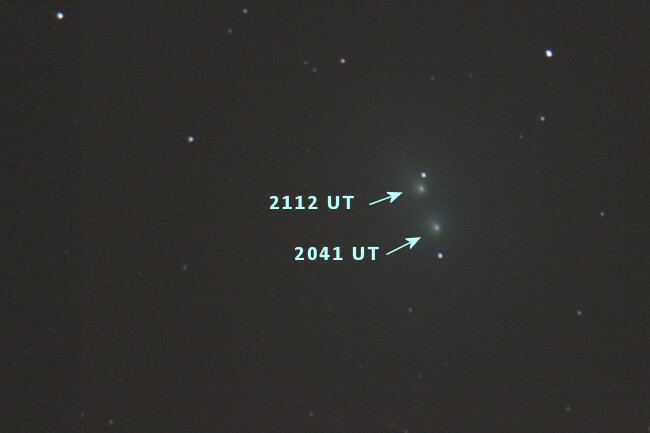 Comet Wirtanen is climbing out of the murky horizon, and the moon is keeping back for a while. However clouds insisted on making an appearence too, making this a very frustrating observing session. 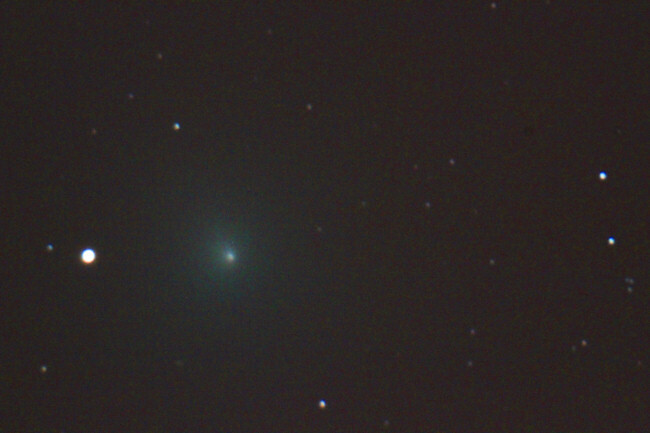 The comet was 13 degrees above the horizon when I took this 60 sec photo. It isn't particulary bright at the moment, especially being so low down. However it did look distinctly green! I could see no tail. I would estimate about 8th magnitude. Let's hope it brightens up soon. The comet was moving fairly quickly against the background stars. Here is a double exposure showing the movement over about half an hour. 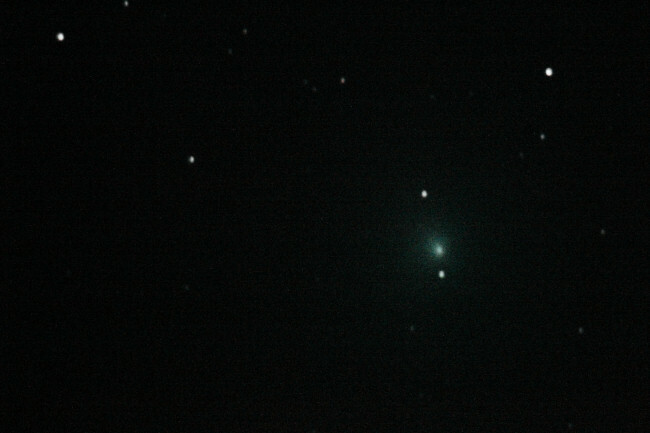 A second clear night, and the comet is a couple a degrees higher at 15 degrees. It looks a bit brighter, and the fuzzy bit is clearer given that the sky is slightly less affected by the murk! I had no problems finding the comet with the goto telescope mount, but I have yet to see it through binoculars. I still think it is about 8th magnitude. The 'bright' star to the left of it is 6th magnitude, and the comet is nowhere near as bright as that star. The star at the bottom is 9th magnitude. The sky was clearer last night here than it's been for a while but very wet in the air. I got the binoculars out but couldn't find the comet. According to Stellarium when it gets to 28° on the 6th it will be near 4th magnitude Azha. I'm afraid to say it, but I'm getting that familiar feeling of 'comet let down'! I'm sorry you didnt get to see it through binoculars, Graeme. It is in an area devoid of bright stars at the moment, but as you say it will be right next to Azha in Eridanus on the 6th December. It might be 6th magnitude by then - if my magnitude estimates are correct - and a lot easier to see. Maybe it will flare up! If anyone else does see it, or image it, feel free to post here if you wish. I'll keep on observing as the weather allows. Monday is looking good for my location, but pretty bad for the rest of the week. No luck from here yet. Wall-to-wall cloud at the moment. Many thanks. 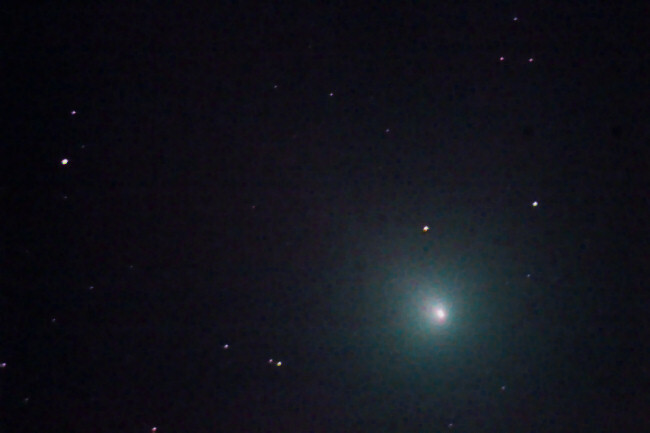 I hope people are spotting this comet, but it is still down the murk for me. It will get a lot higher in a week or two. On the 3rd December it was around 20 degrees above the horizon, and the image has improved a lot. 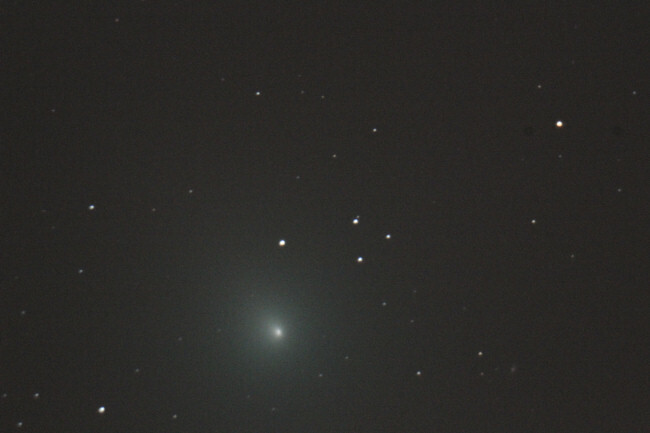 I guided a 90sec image. My worry is that if I take a longer exposure the comet will 'trail'. A bit of a cold and blustery evening, but Wirtanen is nearly 30 degrees high now. I was able to see it in binoculars, but the view isn't very good. It is spread out, and the contrast with the sky is poor. It actually looks a lot better through the telescope. The 'nucleus' was a little brighter than before, perhaps more like 6th magnitude. The coma looked more condensed. The green colour was more obvious now it is brighter. It looks larger than previous evenings. By guiding the telescope I was able to get a 120sec exposure, but that did little to increase the contrast with the sky. I'll try stacking some images tomorrow, even though it will trail the stars. I also have some images I took with the wide-field guidescope that might be worth showing. Last edited by Aratus on Sat Dec 08, 2018 1:01 am, edited 1 time in total. Wirtanen is up level with Rigel now at 26 deg. It was clear enough to spot the 6th magnitude stars in the area Stellarium says the comet is in binoculars but still no sign of it yet! I'm hoping to get the telescope unpacked and set up tomorrow so if the clouds stay away I should be able to spot it. I looked for it through binoculars on 3 occasions last night. I found it on only 2. For the third I just couldn't find it. It looks like a largish faint circle of cloud. The 'nucleus' wasn't visible, which surprised me. It still isn't near any bright stars for reference, but that will change next week. I not hopeful for Saturday, but Sunday looks good. Good luck.